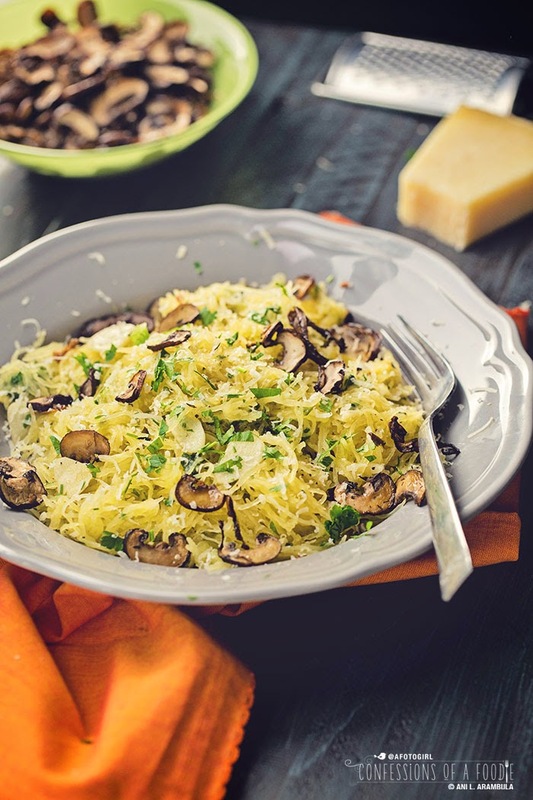 Swapping out the pasta for spaghetti squash, the classic Aglio e Olio is updated for a low carb lifestyle. 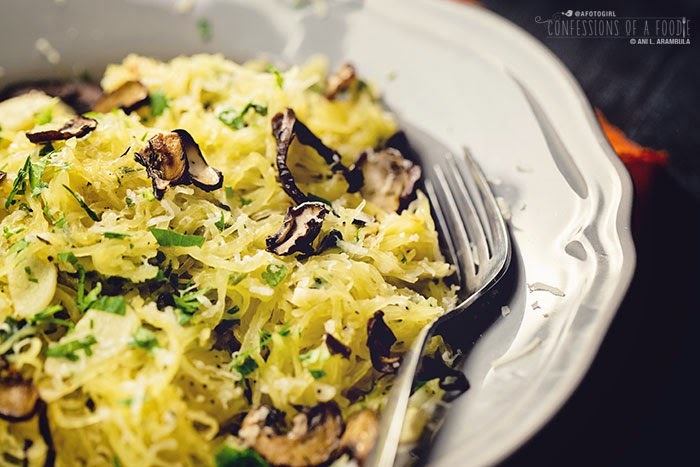 Swapping out the pasta for spaghetti squash, the classic Spaghetti Aglio e Olio is updated for a low carb lifestyle. One of my favorite dishes before my diagnosis was a terrific pasta dish that I learned to make when I was living in the Bay Area attending art college. Melba, whom I’ve spoken about before, made it for me a few times when she and her hubby-to-be had me over to share a rooftop dinner. It was by far my favorite meal. With the cost of the ingredients not being a huge hit on the wallet of a college kid living off of work-study, I made it often. It was everything comfort food should be: warm, cheesy, creamy, stick to your ribs kinda good. It wasn’t until years later that I learned it was called carbonara, although she taught me to make it with penne instead of spaghetti. I really prefer Melba’s way because that creamy sauce gets trapped inside of the penne and when you bite into it, it bursts in your mouth. And for me, the pasta was an excuse for that sauce. Another of my favorite simple pasta dishes is spaghetti aglio e olio which translates to spaghetti with garlic and olive oil. Also known as Midnight Pasta, thin slices of garlic are cooked in a sea of olive oil with some crushed red pepper flakes to which cooked spaghetti is added along with some of it’s cooking liquid to thicken the sauce. It’s finished with copious amounts of chopped flat leaf parsley and good Parmigiano-Reggiano. Humble ingredients, yes, but the combination is ridiculously delicious. I won’t lie. I miss eating pasta with that kind of joyful abandon. 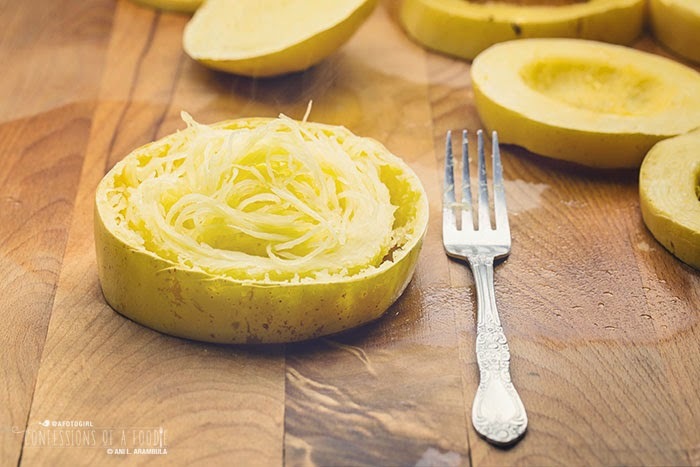 Lucky for me, even in my before, I loved squash, especially spaghetti squash. With a one cup serving clocking in at a mere 2 on the glycemic load chart, it’s a healthy way to get my “pasta” fix in. 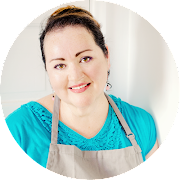 A few weekends ago, I had my sister Deb over to spend time with her and taught her this dish as I was making it for this post. Unbeknownst to me, she wasn’t a spaghetti squash fan but enthusiastically agreed to come over and help me with it nonetheless. I felt badly that she wasn’t a fan and that I hadn’t known beforehand. I would gladly have swapped it out for a different dish on my blog calendar had I known. But we pushed forward. I was determined to revamp my favorite aglio e olio into a dish I could eat without the guilt of setting a huge bowl of pasta in front of me. 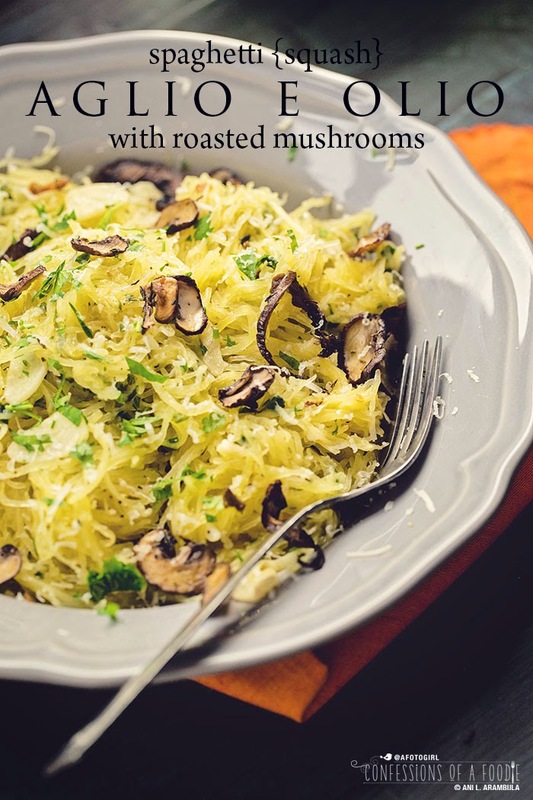 I've written about spaghetti squash a few times before (here and here), showing you a very basic roasting technique. A few months ago, I came across a pin on Pinterest that blew my mind. Instead of cutting the squash lengthwise, this gal cut it widthwise. Bloody hell. Why had I never thought of that before? If you look at my photo above of the cut and seeded slice, you can see that the squash grows in concentric circles much like a tree. 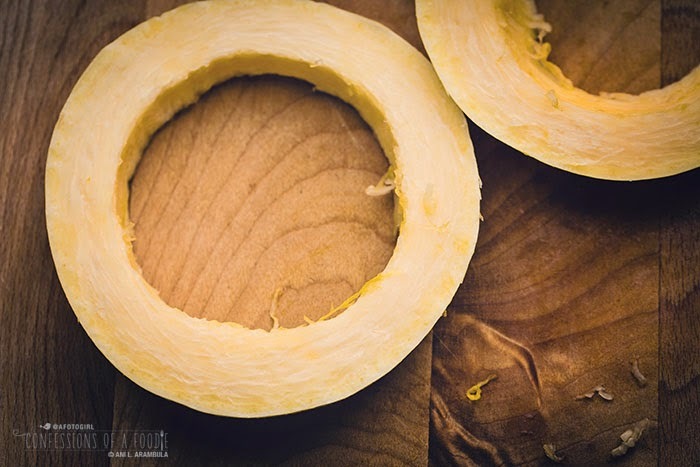 When you cut the squash lengthwise, you are cutting right through those circles. By cutting widthwise, instead of those short strands of squash, you get these gloriously long strands that better evoke wheat spaghetti. BrillIant. Am I not right? Besides their length, this way of cutting is also much faster cooking. Now I don't cook my squash as long as the gal over at Eat Within Your Means because I like my squash to be "al dente" with a bit of texture and crunch. 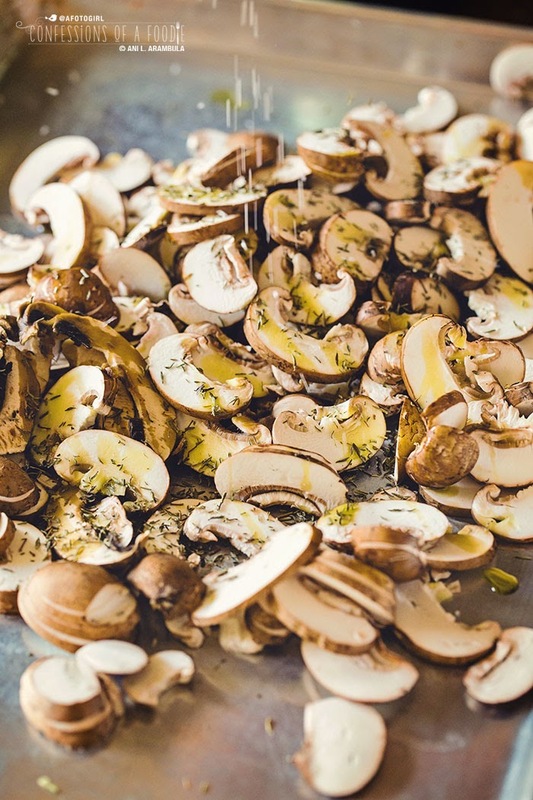 Although traditionally, mushrooms do not make an appearance in aglio e olio, I added them to boast the protein. Roasting them brings out a depth of flavor you don't quite get when you sauté them. 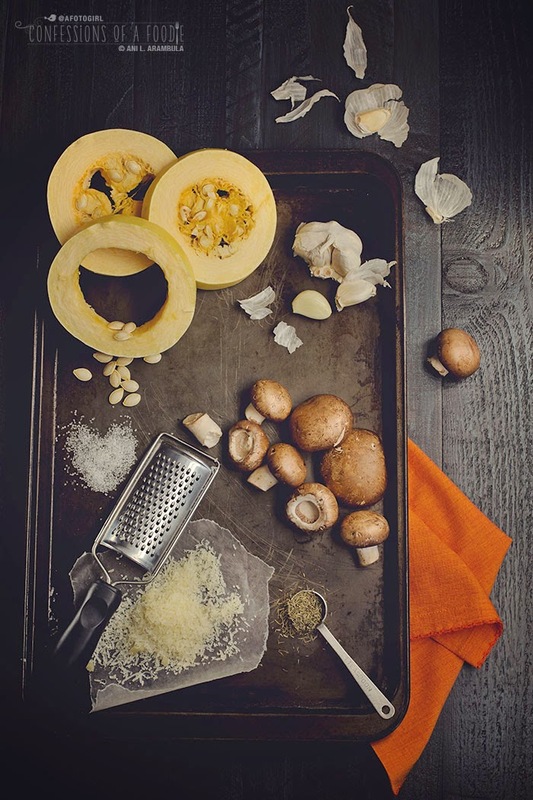 Their earthiness mingles well with the garlic and provides a pleasing contrast of texture against the squash. After the dish had been photographed, my sister and I sat down to eat. 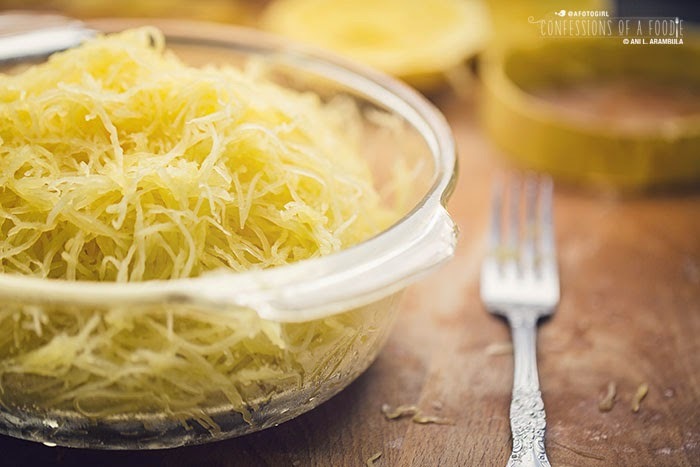 Although she was initially hesitant because it was the texture of the squash that she had not liked before, by her second bite in, she was hooked. When she said the dish was excellent as she went back into the kitchen for a little more, I finally let out a sigh of relief. Yup. Another convert. I love it when I can open someone up to a new culinary treat. 1. Preheat oven to 400 degrees Fahrenheit. Spray two large rimmed baking sheets with cooking spray; set aside. 2. 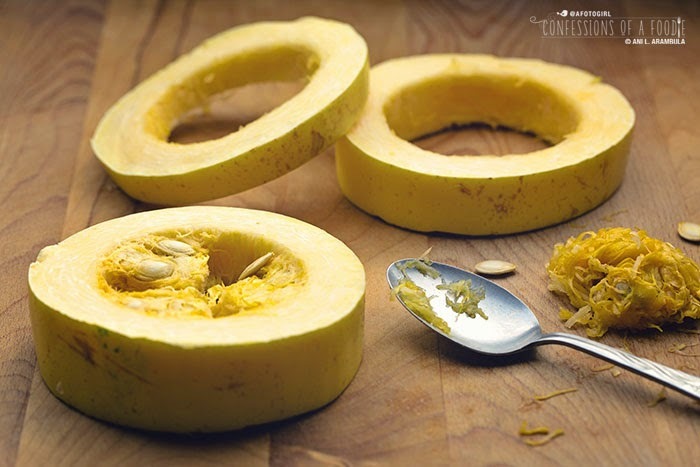 Place the sliced and seeded squash onto one of the prepared baking sheets. Add ¼ cup water and place on the upper rack in the oven. Roast for 25 minutes, or until the squash strands separate easily, being careful not to over bake. You want the squash to still have a bit of crunch and texture to it. Remove from oven; set aside. 3. 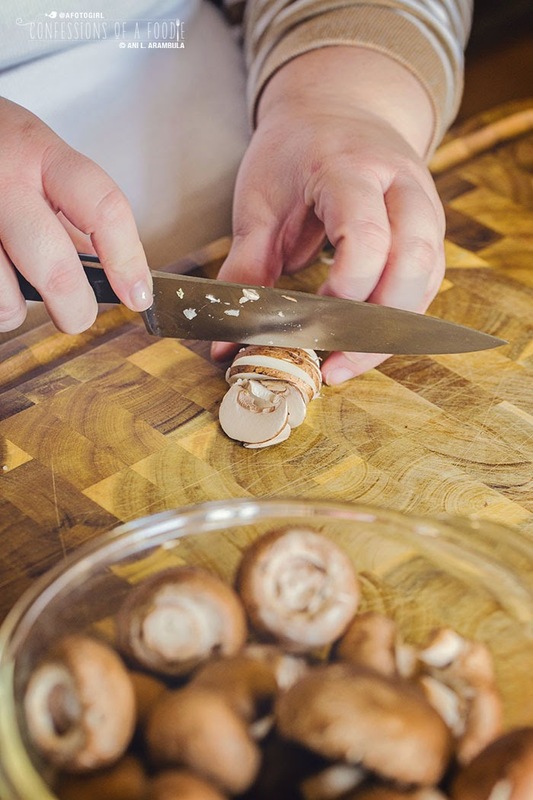 At the same time, add the sliced mushrooms to the second prepared baking sheet. Drizzle 2 tablespoons of olive oil over the mushrooms. Sprinkle 1 teaspoon salt and half a teaspoon cracked black pepper, or to taste, over the mushrooms along with the thyme. Toss to coat well. Spread the mushrooms out into a single layer and place on lower rack in oven. Roast 10 minutes; remove, flip the mushrooms over and roast an additional 5 minutes. Remove from oven and set aside. 4. 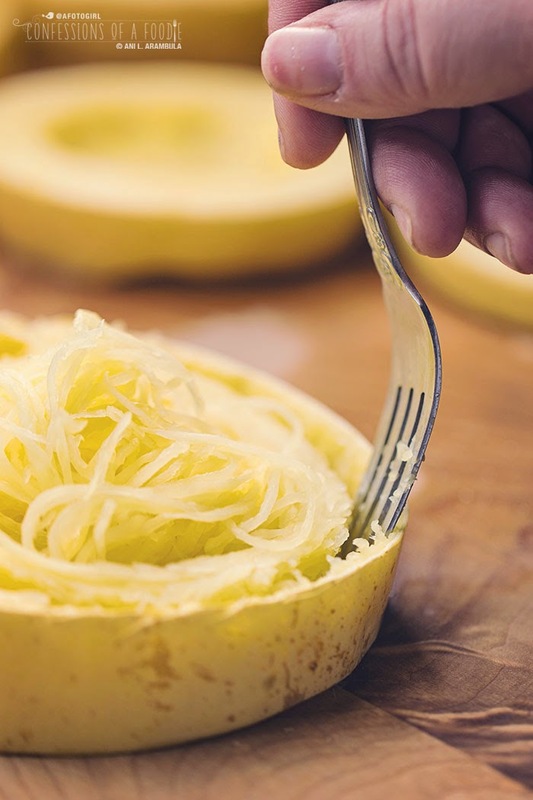 When squash has cooled enough to handle, use a fork to loosen the strands from the skin working your way around the circumference. Remove the skin then use your hands to separate the strands; set aside. 5. Heat ⅓ cup olive oil in a large skillet until the oil is shimmering. Add the garlic and cook for 2 minutes, or until the garlic is softened. Stir in the red pepper flakes; cook for 1 more minute, carefully not to let the garlic burn. 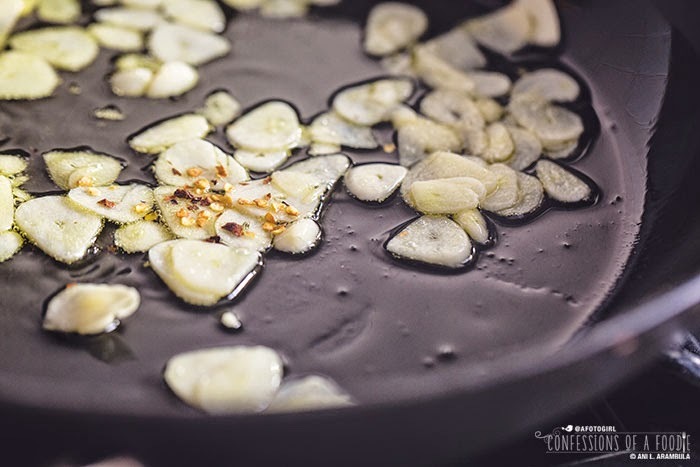 Add the squash to the pan, stirring to coat well with the olive oil and distribute the garlic. Toss in the parsley and ⅔ cup cheese and stir well to incorporate. Divide between 4 bowls and top with mushrooms. 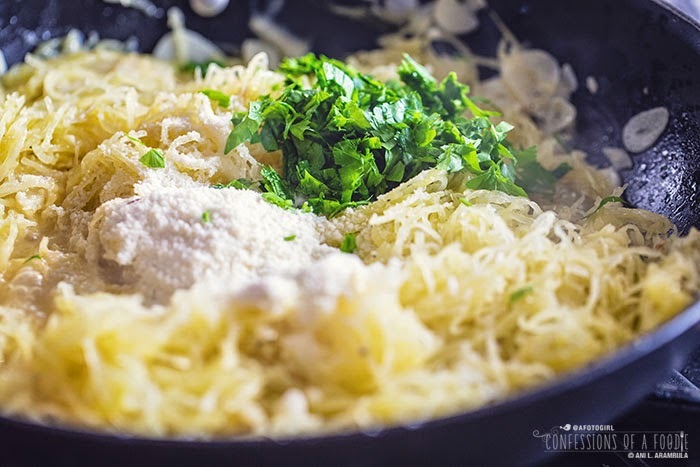 Garnish with additional grated cheese and chopped parsley. Serve immediately. Looks gorgeous & tasty. Gonna make it tonight.